● The King is a serious 4.33 inches tall. 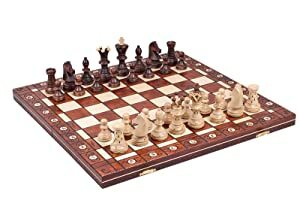 The chess board is 20″ x 20″ and decorated on the borders for display at home or in the office. High in the mystic Carpathian Mountains of Europe, home of the Dragon and the vampire myth, you will find artisans that draw deep from a wellspring of history dating back centuries, honoring the finest traditions in wood carving. This chess set is named after the the mythological deity Jarilo the War God, honored in the mist shrouded mountain. 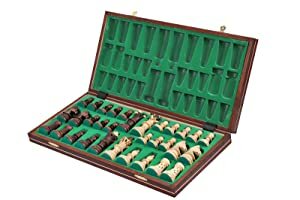 This is just one of the handcarfted artisan chess sets in the Carpathian Collection.These unique and handsomely designed chess pieces are made of Hornbeam and Sycamore both woods that are found in the forests of Europe. Hornbeam (sometimes known as Ironwood) is mostly white and used for intricate and decorative carvings. Sycamore offers a dark brown, smooth textured wood, perfect for the dark pieces. 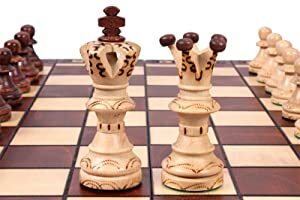 These woods coupled with the craftsmanship of the Carpathian artisans make for some of the finest chess sets available in the marketplace today. Are you ready to begin a lifetime of adventure in chess? 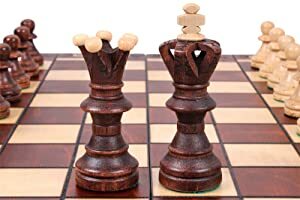 Here is your chance to quickly learn the movements of each chess piece, along with the complete rules of our “royal game”. But that’s only the beginning! Next you’ll want to conquer that first opponent, and Play Chess – Have Fun! will show you how. Play Chess – Have Fun! goes on to fill the gap between knowing how the chess pieces move (the basic rules) and knowing what to do next. This e-book will be a BIG help in quickly and easily absorbing the logic and principles of good chess play. Play Chess – Have Fun! interactive e-book expertly bridges the gulf between the simple rules of chess, and how to actually play a strong chess game. Lewis McClary has been teaching chess for many years, and he has a knack for guiding students rapidly and painlessly to winning chess. So if you want to move beyond merely playing “at” chess, to become a Chess Player, then this is the e-book you need. All of the elements of chess are covered, and no prior understanding of the game is assumed or required – not even a board and pieces are needed with this nifty ChessCentral interactive e-book! You will get insight into Basic Checkmates, Developing your Forces, Beginning Tactics, The Endgame, Understanding the Opening, Strategy and Planning – and much more! There has been a sore need for this kind of instruction, and the ebook will benefit anyone starting on the road to greater chess skill. If you’re ready to start winning games today, download Play Chess – Have Fun! right now…you’ll never find an easier way to get started in chess. Because this is a download you will get started in less than 15 minutes and be playing winning chess today! Highly recommended for absolute beginners and novice players alike. Not only will you learn to play chess and play it well, but this e-book offers a hands-on introduction to chess software! You will need ChessBase software such as the free ChessBase Reader. The download codes for both ChessBase Reader and Play Chess – Have Fun ebook are given inside the package. The Light pieces are made of Hornbeam a wood that is found in the forests of Europe. Hornbeam (sometimes known as Ironwood) is mostly white and used for intricate and decorative carvings. There are no lead weights in these pieces, they are solid wood! 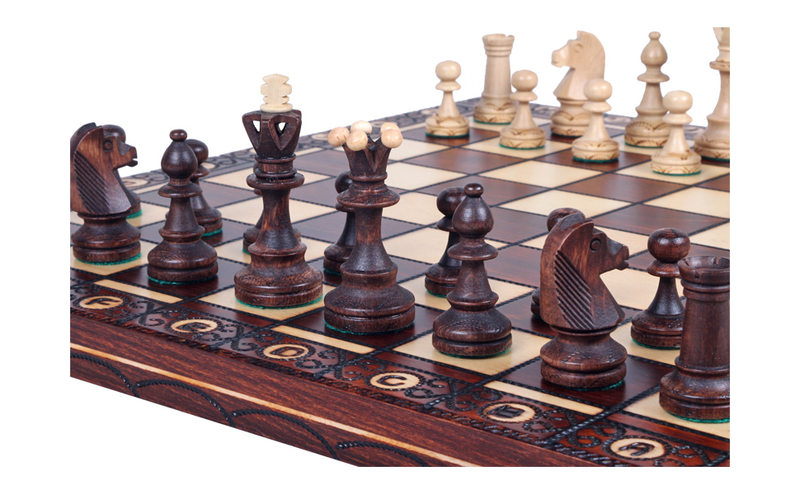 The Dark pieces are carfted from Sycamore which offers a dark brown, smooth textured wood, This woods coupled with the craftsmanship of the Carpathian artisans makes for some of the finest chess sets available in the marketplace today. The chess board lays flat and is 21 ” x 21″. When folded in the center to store your chess pieces, it is 21″ x 10.5″ with a 2.5″ depth. Take a close look at the elegant borders of the chess board. The borders are carved in an intricate design. Brass hinges complete the outside for eay closure. 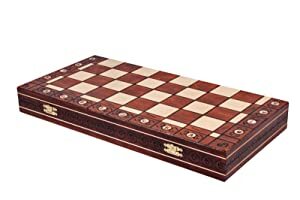 The chess board folds to a store the pieces. The interior of the storage compartment is lined with green felt and each piece is compartmentalized for easy setup.